A simple ingredient that is there in every kitchen across the world and is so taken for granted, but has the potential to create innumerable special dishes. Yes, it is plain flour which is called maida or all purpose flour. From delicacies like cakes and pastries to croquettes and ghugras, from everyday dishes like quick-fix dosas to exotic rotis, plain flour (maida) is so versatile that the jar is opened almost every day! It has a mellow, bland flavour, which makes it suitable for many dishes. Dough made of plain flour (maida) is much softer and pliable compared to whole grain dough, which makes it ideal to make wraps and rolls that can burgeon with fillings! Given below are a sample of our Maida Recipe Collection. 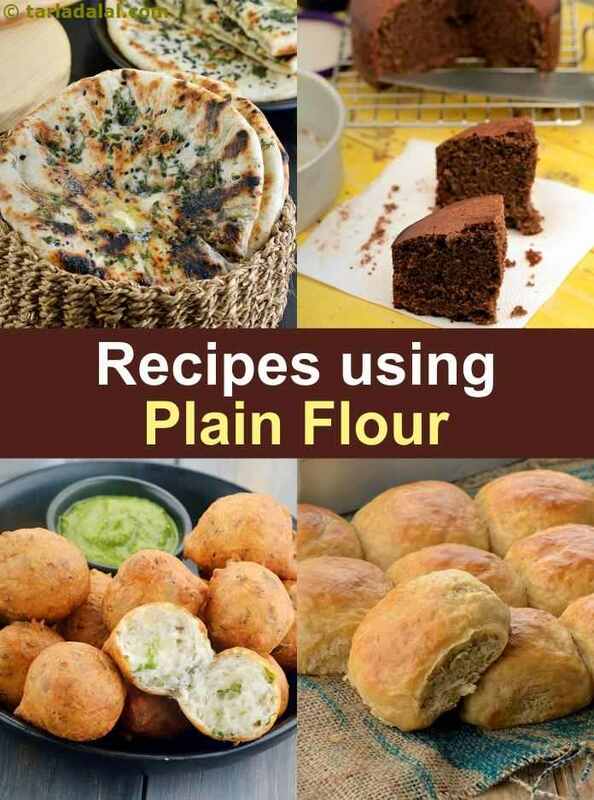 Plain Flour is used in Indian dishes from Baked Vada Pav and Maida Dosas, to Aloowali Roti and Aloo Cheese Croquettes, from Aloo Kulcha to Moong Dal Kachor, this article introduces you to a range of dishes made with plain flour (maida). Each is just an example from a category, and you can find many more options in each category like snacks, rotis, pies and cakes on our website. Breakfast gets way more tasty with plain flour recipes. Some nice tasty Apple and Buckwheat Pancakes with some yummy Homemade Cinnamon Rolls Recipe, Eggless which kids love. Even Veg Puff are great to serve. Try Mysore Bonda with a steaming cup of South Indian Filter Coffee. We hope you enjoy 2,000 recipe collection of maida recipes. A simple recipe of eggless sponge cake can be use as a base for many other desserts like pineapple gateau, orange gateau, almond praline cake etc.